The UT University Chorus is a new and exciting ensemble comprised of music majors and non-music majors from UT’s entire campus alike! University Chorus is directed by Iain Sturrock. Make sure to keep an eye on the Butler School of Music Calendar of Events to stay up to date with concerts and events with the University Chorus. 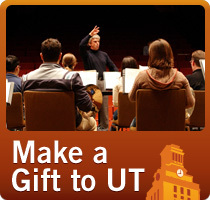 Audition details and sign-up are online at www.wejoinin.com/UTchoirs.